News - Wireless Remote Control for Electro Permanent Lifting Magnets - Armstrong Magnetics, Inc.
EPRC-3 wireless remote control is used for switching on and switching off the magnetic holding force of Armstrong Electro Permanent Lifting Magnets, including battery and mains electricity activated Electro Permanent Lifting Magnets or lifting systems. Being small in size, it has strong anti-interference ability, low power consumption and many more benefits. It has three buttons: MAG, DEMAG and UNLOCK DEMAG. Pressing the button of MAG can activate the magnetic power of Electro Permanent Lifting Magnets and pressing the buttons of DEMAG and UNLOCK DEMAG simultaneously can switch off the magnetic power of Electro Permanent Lifting Magnets. A particular EPRC-3 can only control its corresponding Electro Permanent Lifting Magnet or lifting system only. It cannot control other Electro Permanent Lifting Magnets. The reason is that an EPRC-3 and a radio receiver inside the Electro Permanent Lifting Magnet must have same code for wireless communication. The dimension, including the black rubber protective sleeve, is 4.2” x 3.2” x 1.6”. The weight, including the rubber sleeve, battery and neck strap, is 0.39 lb. EPRC-3 uses a 6F22-9V battery. 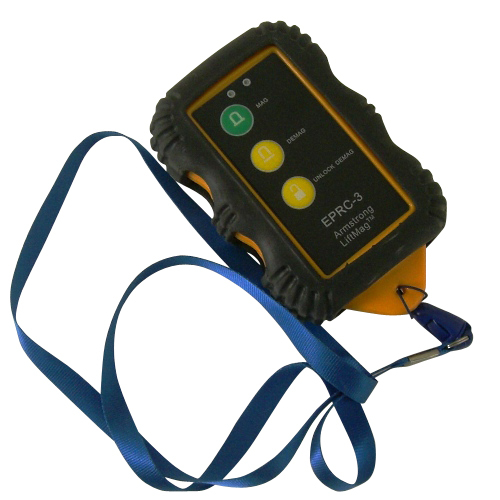 Hang EPRC-3 with the neck strap, you don’t need to hold it all time. The maximum control distance is 30 feet from the Electro Permanent Lifting Magnet, so workers can stand far away from the lifting magnet and the operation would be safer. EPRC-3 is not the electrical power switch of an Electro Permanent Lifting Magnet itself, it is only a switch of the magnetic holding force of the Electro Permanent Lifting Magnet. You must switch on the electrical power of an Electro Permanent Lifting Magnet at its front panel first. EPRC-3 is an optional part for ordering Electro Permanent Lifting Magnets.